You have just been diagnosed with breast cancer. But what is the next step? Unfortunately, half of all breast cancer patients receive chemotherapy unnecessarily. MammaPrint is unique. It is the only test which can indicate with precision which stage your tumour is at, so that you and your surgical or medical oncologist can decide on the most appropriate treatment for your condition. Agendia’s MammaPrint is a test which determines how aggressive a breast cancer tumour is. The MammaPrint result will enable your surgical or medical oncologist to determine what would be the best kind of treatment for you following your operation. MammaPrint is carried out on tumour tissue that is fixated in formalin or fresh, which is put in an mRNA preservative immediately after the operation has taken place. This tumour tissue is sent off to Agendia’s clinical laboratory, where a histological staining test is done, to verify that the tissue indeed carries a tumour: the staining test checks whether the level of tumour cells is at least 30%. MammaPrint is a breast cancer test which is performed using microarray chip technology. This is a small solid surface which is split into thousands of tiny grids. Each grid contains DNA. In each grid the DNA has a different code, which corresponds with the code of precisely one gene. Only the RNA of this particular gene can attach itself to this particular grid. DNA microarrays enable you to study the activity of hundreds or even thousands of genes simultaneously. MammaPrint measures the mRNA level of 1900 different genes, whereby the expression of 70 specific genes is measured six times, in order to examine them in greater detail. The result of a MammaPrint is very clear: there is either a low risk of metastasis (‘good prognosis’) or a high risk of metastasis (‘bad prognosis’). 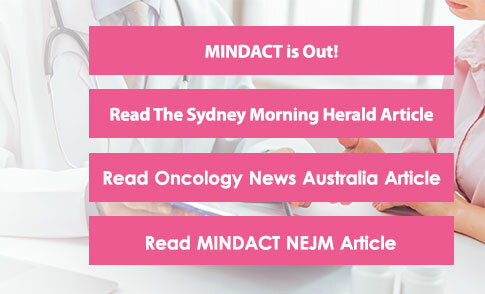 Dr Guy Hingston now recommends that women who are considering undergoing chemotherapy should consider having a MammaPrint test to help them decide whether to have chemotherapy or not – if they have a new diagnosis of breast cancer which is up to 50mm in size, with up to 3 lymph nodes involved, is oestrogen receptor positive and is HER2 receptor negative.